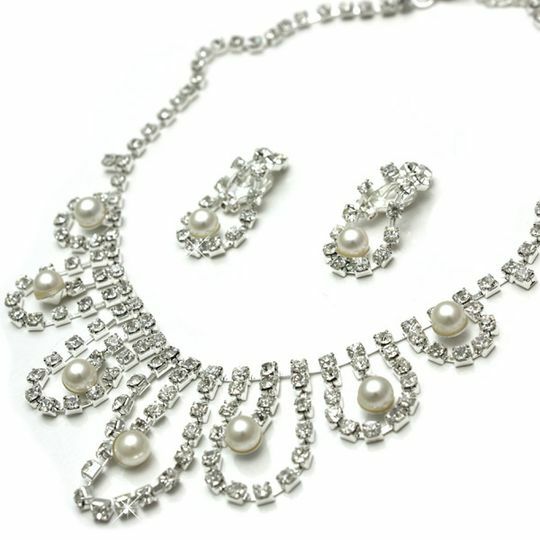 This elegant Silver jewellery set boasts a very regal design of sparkly clear crystals and faux white pearl beads. A vintage design with modern ingredients to make a bold splash at that special occasion, whether it be a wedding, prom or special night out! Necklace length adjustable from approx 33cm upto 40cm with extender and lobster clasp. Non-pierce clip earrings with a 3cm drop.